Synthetic fragrances and perfumes contain more than a hundred chemical compounds, many of which may be harmful to health. The ATTITUDE solution? Purifying the air in your home with activated carbon while creating the desired ambiance thanks to natural essential oils. 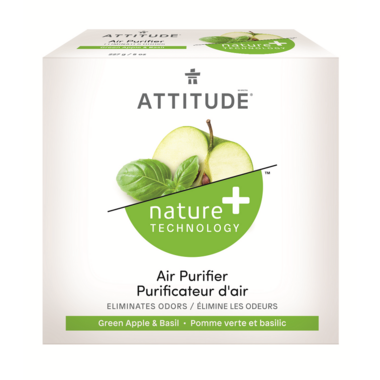 We trust ATTITUDE's Natural Air Purifiers are a better option than spraying chemical compounds. Enjoy for up to six weeks, depending on room size. Amazing! I've tried 3 varieties of this product and I honestly don't think the essential oils last long enough to make much of an impact. HOWEVER, where this product shines is in the activated carbon which does make a huge difference in the bathroom and in the kitchen without introducing other odours. In just 10 minutes, the bathroom is smell-free. It takes probably 20 minutes for a larger space such as frying smells in the kitchen, but it does take care of that too, if you are patient - all without having to light candles or incense, or spray anything into the air. It's the disappearance of offensive smells I'm after - not mixing those smells with any other fragrance whether natural or artificial. Great product! Will buy again.
. sorry I will not be buying again. Nice fragrance but weak. Sorry, probably won't buy again. I really wanted to live this but alas I didn't find it effective. Used it in a small space and could not notice a difference. Likely won't buy again. Not what I was hoping for. Though it may be a good neutralizer, I don't detect any fragrance of apple in the small bathroom I placed it in. Disappointed and will likely not repurchase. I was on the fence about this. But after trying it for a day I think it really does work. For some reason my garbage kept making my bathroom start smelling after a few days of changing it. I put this in yesterday and since then I haven't been able to smell any odor from the garbage. Just the scent of this thing, which by the way, smells great. I already ordered another one. VERY GOOD PRODUCT FOR MY NEW RENOVATED LIVING ROOM.